COLLINGWOOD spent a significant and often fruitless portion of the 1980s searching for a speedy and classy rover. Darren Collins was one of those who briefly looked like he might provide the answer. He debuted for Collingwood as a 17-year-old schoolboy, kicking two goals in his first game in 1985. But he was gone from Victoria Park before his 19th birthday. It was a fleeting stay that never quite gave him the chance to mature. Once likened in style and appearance to Hawthorn’s great rover of the early 1970s, Peter Crimmins, the kid from East Reservoir would only get the chance to play 21 games across two seasons before playing elsewhere at two rival clubs. Through those two seasons in black and white, Collins was used more as a small forward than the rover he wanted to be, but he still managed to make an impression on Magpie fans, averaging a goal per game with the Pies. Collins was fortunate enough to be playing at any level in his teenage years, given he was almost lost to the game three years before making his VFL debut. As a rising 15-year-old, in 1982, he suffered a disease in both knees that saw him forced to take a break from the game he loved. For a time, he didn’t know how long he would be sidelined, but ended up being forced to the sidelines for nine long months. A junior star in the northern suburbs, as the trophies adorning the family mantelpiece showed in a profile story, Collins was invited to Collingwood and made his impact through the under 19s side, where some of his teammates included Neville Shaw, Ron McKeown and Gordon Sumner. 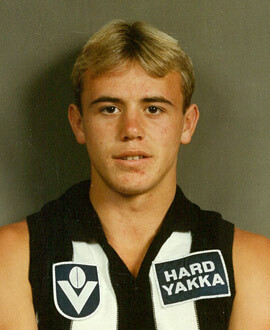 The blond, baby-faced rover won the Magpies’ under 19s best-and-fairest in 1984 – doing it as a 16-year-old – and that alone ensured that he graduated to the senior list the following year, even though he was still eligible for the thirds. He played the first six games in Collingwood’s reserves, pricking the interest of senior selectors with his good form. A senior opportunity arose in Round 7 against Fitzroy at Victoria Park. Collins went from Preston East High School student on the Friday to Collingwood senior footballer the following day. But as much as he performed creditably, the 17-year-old’s team didn’t. Collins kicked two goals, two behinds and had 14 disposals, but the Magpies were never in the game, losing by 79 points. He kicked two goals against Hawthorn in his second game, then scored 4.3 from 18 disposals in his third game against St Kilda. Seven weeks later he kicked 5.1 against Sydney, with one of the observers calling him “gutsy” and “unbeatable”. His 15 games in his debut year yielded 24 goals, a fine start to his Collingwood career, and it seemed as if a long stint was ahead of him at Victoria Park. But a broken collarbone in the preseason leading into 1986 held him back. It set the tone for the year ahead as injuries began to restrict him. He ended up playing six games for the year, kicking only four goals. Still, Collins wasn’t expecting what came next. He was given his marching orders from Collingwood before the 1987 season, which was a shock to him and also to those who had watched him in his debut year. Footscray gave him a chance, and he played 24 games there over three seasons. He managed four games with the Lions, finishing his League career with 49 games in total. It was an abbreviated league career, but Collins still made his mark, and is still remembered by the Magpie faithful for that teenage spirit he showed in his debut season.